Peptides are an absolutely fascinating group of ingredients that ongoing research has proven can benefit several age-related skin concerns. Whether you’re struggling with wrinkles, loss of firmness, discolourations, dehydration, dullness, and on and on, there are peptides that can make a visible difference. What you need to know is while peptides are skin-natural ingredients, not all are created equal! The most effective peptides are bio-engineered to remain stable. That means they can deliver their benefits precisely where they will do the most good. In order for that to happen, the peptides must be able to penetrate skin’s uppermost layers where it can begin “schooling” skin —literally “teaching” it how to look younger and healthier. Simply put, peptides are skin-natural ingredients composed of fragments of amino acids. Amino acids are the building blocks of proteins, and proteins (primarily keratin) are a fundamental building block of skin. While peptides are a natural component of skin, it’s important to know that in their natural form they’re very fragile, unstable ingredients. That’s why we utilise specialised, lab-engineered peptides. These “designer” peptides are not only exceptionally stable, they can be created to specifically activate a youthful element of skin. For example, peptides can “turn on” the parts of skin that help visibly improve skin tone, hydration, a feeling of suppleness, and a smoother surface. Paula’s Choice Skincare has been following the research on peptides for years, watching it go from skeptical theory to the latest research about which peptides really can provide highly targeted results when properly formulated. The science and potential benefits are truly impressive! The exciting developments led us to formulate our Peptide Booster. It’s the only peptide-enriched product that contains a multi-faceted blend of proven peptides plus additional amino acids, skin-replenishing, and antioxidant ingredients. 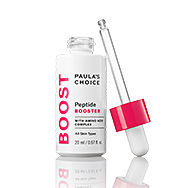 As impressive as certain peptides are, your skin always needs more than one great group of ingredients can provide—which is why we followed our “cocktail” approach to this innovative booster, something we do with all Paula’s Choice treatment products. What Do the Peptides in the Peptide Booster Do? Each peptide in the Peptide Booster was chosen based on its unique qualities to improve your skin, how it complements the other peptides, and its compatibility with other anti-ageing ingredients. Peptides work perfectly with proven age fighters like retinol, vitamin C, and niacinamide, just to name a few. Is the Peptide Booster Right for Me? Peptide Booster is formulated for all skin types and all ages (just like eating a healthy diet, it’s never too early to begin giving your skin the ingredients it needs to be healthier). A few drops of its silky, serum-like texture glides over skin without feeling greasy. Peptide Booster layers beautifully with other leave-on products in your routine. Who will benefit most from using Peptide Booster? Its combination of peptides, amino acids, and other beneficial ingredients improves every aspect of skin (even if you’d describe your skin as “normal”), but those struggling with loss of firmness, dullness, and uneven skin tone will see the most dramatic results. Peptides aren’t just the building blocks of protein, they’re the foundation of better-looking skin for everyone! How Do I Use Peptide Booster? Peptide Booster can be applied once or twice daily, after cleansing, toning, and exfoliating. You can dispense a few drops and apply on its own or add to your serum, eye-area product, or non-SPF moisturiser. During the day, finish with a sunscreen. At night, if you opt to apply Peptide Booster separately, finish with a moisturiser for your skin type. You can also layer Peptide Booster under or over any of our other boosters for customised results.